MAKE SURE YOU SIGN UP IN OUR FORUMS! All of our race emails are sent thru your forum membership! Little Rock, AR - Qualifying @ EVR Motorsports CompleX - 3 Attempts at 3 Laps each. 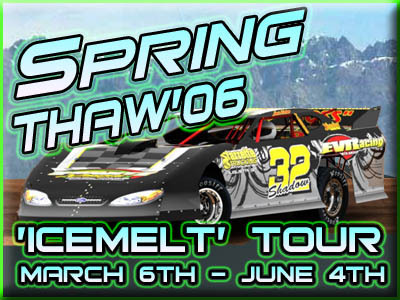 Qualifying for Round #10 of MARS ST'06 "IceMelt" Tour is posted. EVR_BlackJack nabs another Pole this season by posting a great 3 lap Qual time of 48.4735. This track is banked and bad fast! Crew Chiefs will need to load their gianormous motors! The track will require the some serious horsepower! The drivers will need nerves of steel to keep their foot into the gas! Hope everyone is up for the challenge! You don't want to miss out on Twin25 features! The MARS series repeatedly draws the best veterans and hotshoes in the DTR2 community. Check out the Qualifying Results posted HERE !!! You don't want to miss out on all the racing action! We run Twin10s at each of the first 4 tracks and then finish the evening off with a 51lap feature at the 5th track! Check out the Area51 Qualifying Results posted HERE !!! IGGR_SoftShoe SWEEPS Twin25 wins @ EVRM !!! EVRacing Motorsports CompleX - was host to the Super LateModel MARS Series last Monday evening. "EVRacing Motorsports Group" was the sponsor of the event! ATTENTION: MARS Officials have announced a much needed break for the upcoming Summer Season. Instead of league racing we will concentrate on improving our driving and professionalism with some "TEST-N-TUNE" sessions. 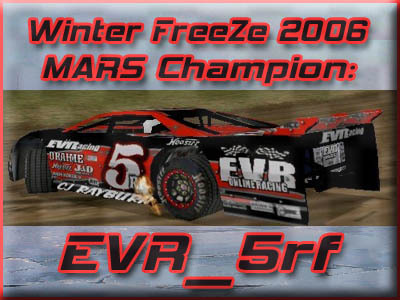 Congratulations to EVR_s32 for taking the checkers at the Winter FreeZe'06 MARS Area51 Classic from Creasman. Check out the MARS WF'06 AREA51 Event Results! MARS Pits Open @ 7:00pm EST. Drivers meeting @ 7:15pm EST. Heat Lineups @ 7:30pm EST. EVR MARS Website Design - Adam Zuidema "EVR_Z"